As I look up at my calendar and see that we’re already in February, I’ve come to a surprising realization: Above the Canopy is almost two years old! Unlike most birthday parties for 2 year olds, I thought it’d be a good idea to nix the pizza, birthday cake, and screaming children in favor of a new tradition: an annual “state of the blog” post. 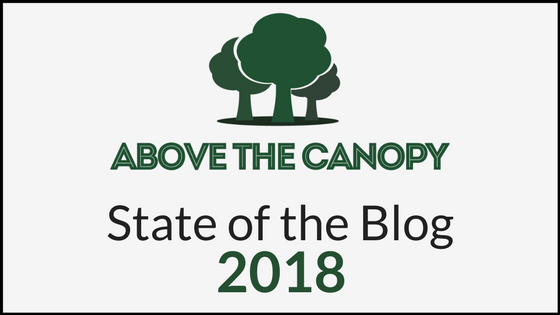 Above the Canopy has come quite a long way in its short life, and I’d like to take this opportunity to touch base with you, the readership, on the state of the blog. The state of the blog is strong! Overall I feel pretty good about Above the Canopy. Especially considering the challenges of balancing new content with the needs of a small business. As you may know, I spend most of my waking hours building & managing my financial planning business, Three Oaks Capital Management. And as it turns out, growing a small business is a massive job. Between that and family life I’m not quite able to give Above the Canopy the attention that I’d really like to. Nevertheless, there’s a lot that I’d like to do with Above the Canopy. And despite the demands on my time, readership is is growing at a strong clip. Over 7,000 visitors found the site last month, which is over a 100% increase from January of 2017. On the year, we had 47,446 visitors to the site vs. 12,925 in 2016. (Keep in mind that the blog launched in April of 2016 though, so it was a short year). As far as posting went, I managed to publish 30 times in 2017 vs. 38 in 2016. Not as frequently as I’d like but hey, I’m learning as I go here. There are several things I’d like to improve on the site in 2018 and beyond. I’ll cover them below by listing each individual objective. My hope is that communicating them will give you some insight into where the blog is headed (and give me a little more pressure to get them done!). And as always, I’d love some feedback on what you enjoy about the blog, what you don’t, and what you’d like to see in the future. Feel free to share in the comments.